Biskupin is an archeological site and a life-size model of the oldest Iron Age fortified settlement in Kujawsko-Pomorskie, Poland from 736 BC. It belonged to the Biskupin group of the Lusatian culture. When first discovered it was thought to be early evidence of Slavic settlement but archaeologists later confirmed it belonged to the Biskupin group of the Lusatian culture. The excavation and the reconstruction of the prehistoric settlement has played an instrumental part in Polish historical consciousness. 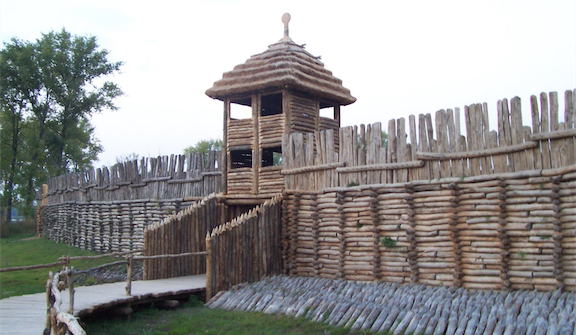 The settlement was surrounded by a tall wooden wall, or palisade, set on a rampart made up of both wood and earth. The rampart was constructed of oak trunks that form boxes filled with earth. The rampart is more than 450m long and accompanied by a wooden breakwater in the lake. About 6000-8000sq m of timber have been used in the construction of the rampart. The site is one of Poland’s official national historic monuments (Pomnik historii), as designated September 16, 1994, and tracked by the National Heritage Board of Poland. Historic site: The Biskupin reconstructed gate and wall.